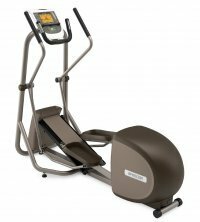 Biomechanics: Patented, low-impact EFX® motion is smooth and natural, providing the lowest Rate of Perceived Exertion of any cardio exercise system to make your workouts more comfortable, even though you are working out strenuously. The patented motion allows your heels to remain in contact with foot pedals, reducing muscle and tendon stress. Color: Warm Brown with Warm White accents. Black CrossRamp. User IDs: User IDs allow you to enter and store personal preferences to quickly retrieve for future workouts. A great option for households with more than one user, so you each can store your preferences. SmartRate: instantly displays heart rate. When age and weight are entered, SmartRate helps the user to stay in fat burn, cardio or peak target zone for a more efficient cardio and weight loss workout.